Cruising the news this morning I came across an interesting Peter Hartcher piece from a few days ago. I say interesting as I don’t particularly find Hartcher’s work normally interesting, a tad too self-important for mine. In fact the only reason why I read it at all is that it was in reference to what I term ‘Clive-aggedon’. Clive Palmers electorate is not only in my backyard, and call me childish if you will, I have to admit to a perverse pleasure in watching both the media and political players squirm and twist themselves in somersaults trying to work out how the hell Clive fits in their nice neat worlds. Hartcher’s piece this time was actually not too bad, it focussed on populism and Clive’s form of cashing in on ‘distressed’ property/business. From what I know of Clive, that is actually pretty spot on. Where the piece got really interesting was at the end where he raised the The 2014 Lowy Institute Poll findings that democracy is held in pretty low regard and the reasons why. I was like hello, not heard that before? 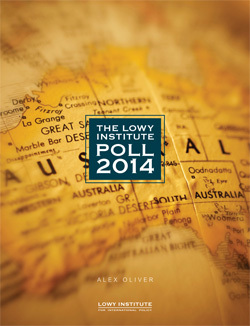 Earlier in the week I saw a lot of reporting on the The 2014 Lowy Institute Poll and it tended to be focussed on it’s key findings, both China & Japan are our ‘best friends’ in Asia, we are pretty cool with spying on other countries and the Coalition Government are legends with their turn back the boats mantra. I didn’t see or hear any mention of Australians thinking that democracy wasn’t too crash hot, so thought it best to rock over and have a look for myself. While the media were talking about Government vindication with “Sovereign Borders” policy, in the interests of balance, maybe should have reported the above ‘key’ finding as well? I will leave that one, as it is for others more knowledgeable than me to analyse. What interested me was page 13 of The 2014 Lowy Institute Poll where we see the title “Democracy is not working” - the background for this assertion starts on page 25 of the pdf – and in the context of the current political climate where we have seen odd ducks elected to the Senate, causing a major headache for the Government in getting pretty much anything passed through the Senate I would have thought this ‘finding’ would have been big news? "To explore the thinking of the 40% of Australians who do not agree that democracy is preferable to any other form of government, we presented them with five propositions, and asked them whether each was a ‘major’ or ‘minor’ reason for their views. The strongest response was for the proposition that ‘democracy is not working because there is no real difference between the policies of the major parties’, 45% citing this as a major reason for not preferring democracy. The second strongest response was that ‘democracy only serves the interests of a few and not the majority of society’, cited by 42% as a major reason"
For 18-29 year olds you can actually reverse the order of those two reasons above. Hartchers piece was the first mention I saw of this 'democracy' issue in the media, as opposed to the blanket coverage on the Coalition Government Asylum seeker policy ‘vindication’? Let’s think about this? Do we think ‘Stop the Boats’ is a big deal because we have been groomed to think it or do we really believe it? How else can you explain the top nine electorates in the country who had an issue with Asylum Seekers being from the Queensland electorates that have probably never even laid eyes on an Asylum Seeker? See “Asylum seekers who arrive by boat should not be allowed to settle in Australia.” in this piece based on ABC’s Vote Compass back in August 2013 in the lead up to the election. Personally I find the whole obsession with Asylum Seeker policy a total beat-up started in the Howard Government and perpetuated by successive Governments. In the whole scheme of things on a world-wide basis, we don’t have an asylum seeker ‘problem’ at all yet somehow is has become such a big deal in this nation. In fact, I have to wonder whether it is a chicken egg scenario here? Asking friends about Stop the Boats palaver over the years it seems that most don’t actually have a clue about the Asylum Seeker issue at all, just ‘think’ it is important because they have been told over & over again it is important. Alternatively, we in this nation rarely discuss ‘democracy’ as such, unless it is in relation to other countries. Both the media and political powers that be are very happy with our duopoly situation with the Greens tossed in the mix to enhance the perception of Democracy. In fact, even the odd maverick Senator or MP is also acceptable for the LULZ. What is not acceptable is any other party trying to shake the status quo and from the Democrats to One Nation all interlopers have been sent packing over the years. This brings me back to Clive-aggedon. The reasons for Clive and his Senators holding the balance of power in the Senate come July are varied depending on what publication you read; He ‘purchased’ his seat in parliament; his massive ad spend conned the punters into voting for PUP in the Senate; and my personal favourite, the Senate voting system is broken. Obviously the status quo can’t stop the money aspect - though the Qld LNP are giving it a red hot go with stopping Clive by referring him to their new and improved LNP stacked CMC – but the traditional players can make changes to the way you vote for the Senate, which of course they have done to protect the three main parties in the hope these interlopers don’t interrupt the status quo in future. I am assuming the reasoning behind this ‘Democracy’ finding not being a key finding for the Lowy Institute is that their main focus is International Policy. Though considering the current backdrop of Clive-aggedon and the votes that minor parties and independents received in the last Federal Election, why weren’t the Lowy findings in regard to our attitudes towards democracy not widely reported? Personally I am feeling pretty vindicated as I personally subscribe to notion that Joe Blow & Jill Dill out in the burbs & bush think politics is self-serving and why bother caring about it as “the pollies don’t really care about us only themselves and anyhow, both are bad as each other”. Consider this? IF such high percentages of the Australian population thinks that there is not much difference between the parties and they are only serving the interests of a few, WITHOUT the thought being planted in their minds by the Government and the media, and WITHOUT that concept being flogged to them day in day out, they worked it out all on their lonesome, just what could that percentage actually rise to if it was highlighted in national conversation to the same level as the Asylum Seeker issue? How low could the major party voting go if this issue did get extensive air and print time? Maybe our elected representatives would pay more attention to their electorates? Maybe we could see the major parties consult with electorates more and be more flexible? Could we see factions becoming less relevant as actual party members and individual branches opinions and input rise in prominence? Could we see a rise in Independents like Cathy McGowan and more minor parties as people actually come to grips with the idea they actually do have more of a choice?